We are currently working with P&O Ferries on the redesign of several ships. P&O Ferries are currently in the process of giving several of their ships major upgrades. We are excited to be able to announce that we are once again working with them on the partial refurbishment and redesign of eight ships; the Pride of Canterbury and Pride of Kent, the Pride of York, Pride of Bruges, Pride of Hull and Pride of Rotterdam, and the European Causeway and European Highlander. The Pride of Kent and Pride of Canterbury operate on the Short Sea between Dover and Calais, and these sister ships are receiving identical on-board shop refurbishments and also a bespoke gondola design. Operating on the North Sea, the Pride of York and Pride of Bruges are receiving identical upgrades to several aspects of their interior - we are providing them with new wayfinding graphic signage and also renovating the design of their cabins, lounge areas and coffee shop. Also on the North Sea are the Pride of Hull and Pride of Rotterdam, and these sister ships have undergone an upgrade to the floor coverings throughout the Driver's Lounge, the Driver's Restaurant and the Skylounge. 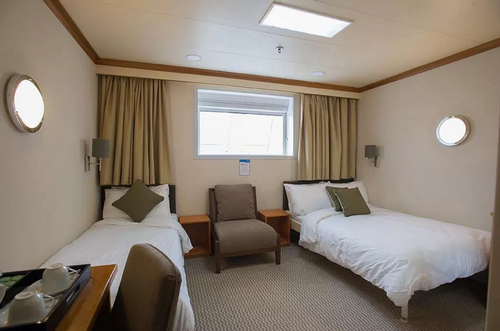 Finally on the European Causeway and the European Highlander, which operate on the Irish Sea, we have created new reception areas for the ships and are now working on refurbishing their on-board food courts. This follows our work with P&O Ferries last year on the Pride of Burgundy, which included wayfinding graphic signage and refurbishments to their on-board brasserie restaurant.